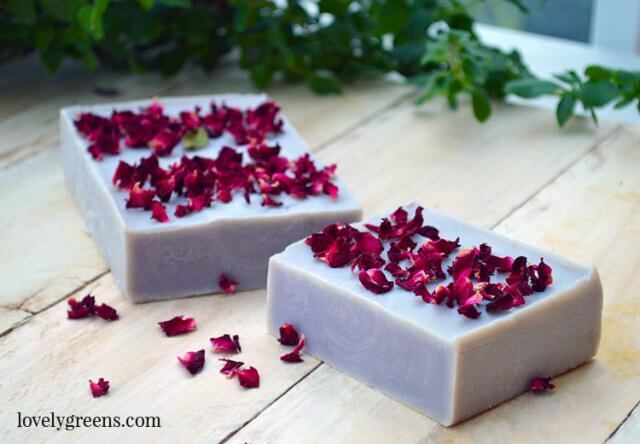 Herbs, Minerals, Micas, Flowers, & other ways to naturally color handmade soap. 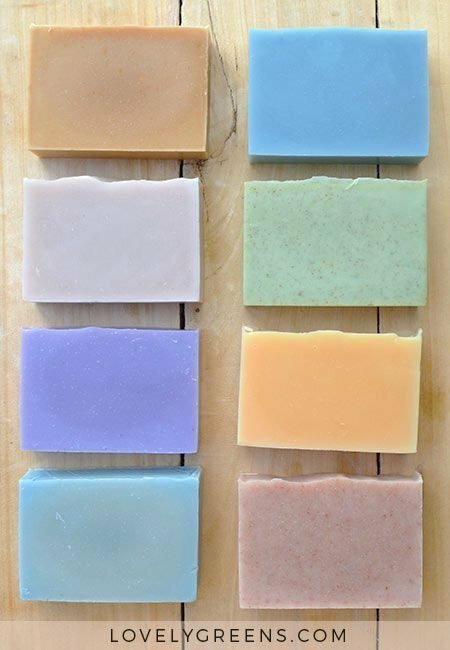 Includes natural soap colors listed by color, ingredient, how to use them. Natural soap making is an exciting craft that anyone can do from the comfort of their own kitchen. 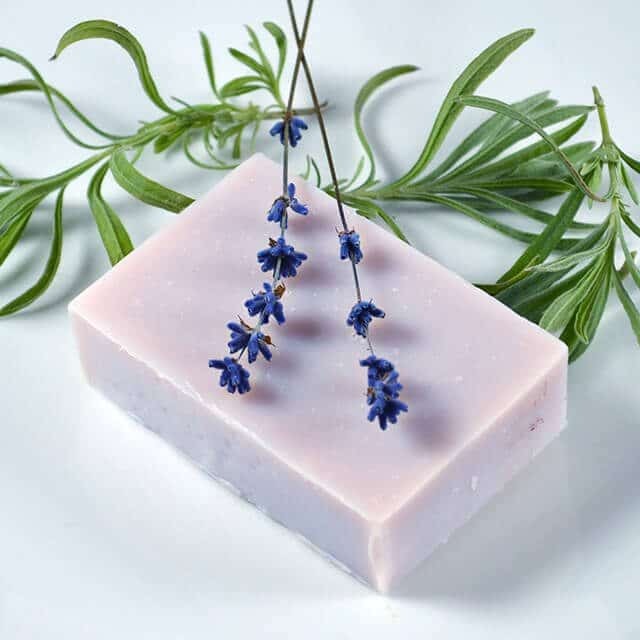 Using oils, essential oils, and the extracts of plants, flowers, minerals, and spices, you can be on your way to creating beautifully scented and colored soap for yourself and loved ones. 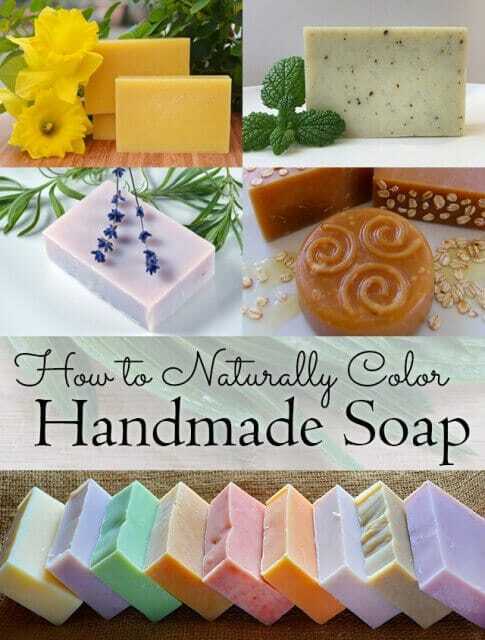 Listed below are various ingredients that you can use to naturally color your soap. Categories are based on final color and the INCI and brief notes are listed beside each listing. Some I have used and have a lot of experience with and some are ideas I’ve found mentioned elsewhere. Unless otherwise stated, the maximum amount you should use in your soaps is 5%. For those new to making soap, please have a look through my four-part soapmaking series listed below to learn how you can get started. Add to liquid oils – mix with liquid oils before pouring them into your melted hard oils. Add at trace – add the natural coloring ingredient after the oils and lye-water in your recipe are mixed together. Infuse with oils – add the material to oils that are liquid at room temperature and either allow them to infuse for two to four weeks in that way or heat gently in until the natural soap color has been released into the oils. If you’re choosing the longer and room temperature method, make sure to shake your container everyday. Water infusion – infuse the material into water and use the infusion to mix into your dried lye. This is essentially a tea. This post lists many of the extracts you can use to create vibrant colors in your soap without the need for artificial additives. Many might be in your kitchen cupboard or growing in your garden already. Others are more obscure and should be sourced from a cosmetic supplier or herbalist. Pretty shades of sky blue to dark grey-blue can achieved with natural soap colors. My favourite of the list is Ultramarine blue but the most interesting is Woad. I’ve grown and extracted the powder in the past and you can see more about that process here. Blue Chamomile oil Azulene Color: Blue - Add a drop or two at trace. Blue Chamomile is extractred from German Chamomile flowers. Cambrian Blue Clay Lilite Color: Shades of soft greens to blues depending on the color of your soaping oils. Mix in water before adding to your soap making oils or lye water. Use 1-2 tsp per pound of oils. Indigo Indigofera tinctoria Color: Denim blue to dark green - Add to liquid oils. Used traditionally to dye fabrics, Indigo is what gives blue jeans their distinctive color. Be careful when sourcing Indigo since many of the dyes today are synthetic versions and not suitable for soap. Ultramarine Blue ci 77007 Color: pastel to vivid blue. Add to liquid oils or at trace. A vivid blue mineral powder that can give a wide range of blue shades. Use 1/16 to 1 tsp PPO and I recommend premixing it in a little oil and then straining it through a sieve whilst pouring into your soap batter. Tiny clumps of un-mixed pigment can leave speckles in your soap if not strained out. This color is considered 'nature identical' but has been created in a controlled lab environment. This is because the truly natural mineral also contains traces of toxic heavy metals that cannot be used in skincare. Bright vivid orange is very easy to get using natural soap colors. You can add specks of orange using pieces of calendula flower petals or go all out for an almost luminous all-over orange. The best orange in my experience is created by annatto seeds. Used in Indian cooking, you infuse the dark seeds into a light oil before soaping. Carrot Daucus carota Color: Yellow-orange - Stir juice into liquid oils before mixing. Orange Zest (peel) Citrus aurantium dulcis Color: Orange - Use finely grated zest/peel at about 1 tsp per pound soaping oils. Paprika Capsicum annuum Color: Peach to light orange to orange-brown - Infuse in liquid oils and discard actual spice or your soap will be scratchy. Pumpkin Cucurbita pepo Color: Deep orange. Stir in as a puree in at light trace. Turmeric Curcuma Longa Color: a common kitchen spice that tints soap light pink-yellow to burnt orange. Can also cause an attractive speckle to your finished soaps but this can be controlled. 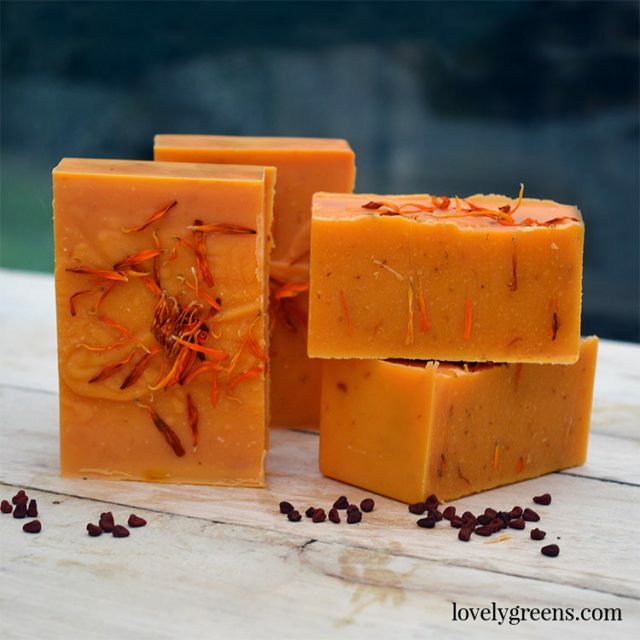 This tutorial shows you how to use turmeric to color handmade soap. Pink is quite an easy color to achieve with natural ingredients. Many of the ingredients used for purple and red will also produce pink in smaller amounts. Of the colorants listed below, you can get one of the loveliest botanical pinks from Madder root. You can either infuse the larger pieces into a light oil before soaping or add powdered madder to your soap at trace. Gelling (insulating) your soap after it’s moulded will intensify the pink. Lady’s Bedstraw, Galium verum Color: Coral pink - Infuse the dried roots in liquid oils. Cochineal Cochineal/Carmine Color: To get a dusky pink you can use an infusion of raw cochineal in your cold-process soap recipes. Please note that this is not a vegetarian or vegan ingredient. Red Palm oil Elaeis guineensis kernel oil Color: Pink to Pinky-orange - Add to liquid oils. Sorrel Rumex acetosa Color: Warm to salmon pink - Infuse the dried roots in liquid oil. Ultramarine Pink ci 77007 Color: pastel pink - Add to soap batter at trace. Use 1/8 to 1 tsp PPO and I recommend premixing it in a little oil and then straining it through a sieve whilst pouring into your soap batter. Tiny clumps of un-mixed pigment can leave speckles in your soap if not strained out. This color is considered 'nature identical' but has been created in a controlled lab environment. This is because the truly natural mineral also contains traces of toxic heavy metals that cannot be used in skincare. You can get some lovely shades of pastel to bright and vibrant purple using natural ingredients. I highly recommend Alkanet from this list though. You infuse the dried, shredded roots into a light oil such as olive oil. 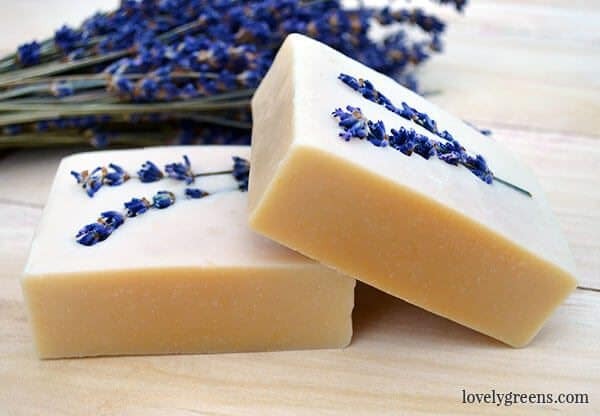 After a few weeks, use that oil as a main soaping oil to get a soft, natural purple soap. Alkanet root Alkanna tinctoria and also called Ratan Jot in Indian cuisine Color: Pink to deep Purple - Infuse in liquid oils. Recipe for Alkanet soap. Cold-infuse 30g dried root or powder into every 454g (1lb) oils for one month. 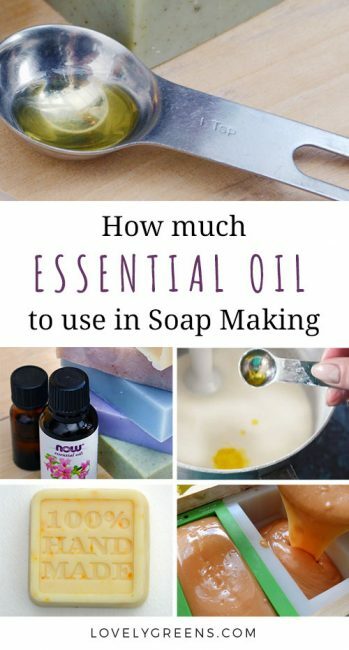 Strain and use the oil as part or the entire soap recipe. You need at least 20% of your soap recipe to include the infused oil to achieve a good purple colour. Anything less and it will come out pink to grey. Use light colored oils as well -- extra virgin olive oil in the recipe will contribute its green colour to the final product. Use light coloured olive oil or pomace olive oil, and other light oils such as coconut, sunflower, and shea butter. Gromwell root Lithospermum erythrorhizon Color: Natural purple. Similar in shade and usage to Alkanet root. Cold-infuse 30g dried root or powder into every 454g (1lb) oils for one month. Strain and use the oil as part or the entire soap recipe. You need at least 20% of your soap recipe to include the infused oil to achieve a good purple colour. Anything less and it will come out pink to grey. Use light colored oils as well -- extra virgin olive oil in the recipe will contribute its green colour to the final product. Use light coloured olive oil or pomace olive oil, and other light oils such as coconut, sunflower, and shea butter. Red Sandalwood Pterocarpus santalinus Purple when soap is higher PH - Add powder direct to liquid oils. Ultramarine Violet ci 77007 Color: Light to vivid violet. Add to soap batter at trace. Use 1/4 to 2 tsp PPO and I recommend premixing it in a little oil and then straining it through a sieve whilst pouring into your soap batter. Tiny clumps of un-mixed pigment can leave speckles in your soap if not strained out. This color is considered 'nature identical' but has been created in a controlled lab environment. This is because the truly natural mineral also contains traces of toxic heavy metals that cannot be used in skincare. It’s difficult to get a true, bright red when using natural soap colors. The ingredients below will give you more natural shades of red-pink to brick red. My favourite in the list is probably Red Iron Oxide. It’s easy to use and reliably gives a pale terracotta to deep brick red. Cochineal Cochineal/Carmine Color: Orange to pink and red - Add powdered to liquid oils or at trace. You can also use an infusion of raw cochineal in your cold-process soap recipes. Using this recipe you can get a lovely dusky pink this way. Please note that this is not a vegetarian or vegan ingredient. Moroccan Red Clay Kaolin Color: Warm-brown to brick-red. Use 1/2 to 2 tsp PPO. Pre-mix in a Tablespoon of water before adding to your main soaping oils. Red Iron Oxide ci 77491 Color: Pale terracotta-pink to deep pink-red. Add to soap batter at trace. Use 1/32 to 1 tsp PPO and I recommend premixing it in a little oil and then straining it through a sieve whilst pouring into your soap batter. Tiny clumps of un-mixed pigment can leave speckles in your soap if not strained out. This color is considered 'nature identical' but has been created in a controlled lab environment. This is because the truly natural mineral also contains traces of toxic heavy metals that cannot be used in skincare. Red Sandalwood Pterocarpus santalinus Color: Red when soap is lower PH - Add powder direct to liquid oils. Rose Pink Clay Kaolinite (Rose Clay) Color: Pink to Brick Red. Add to soap batter at trace. Use 1/4 to 1 tsp PPO and I recommend premixing it in a little oil and then straining it through a sieve whilst pouring into your soap batter. Tiny clumps of un-mixed pigment can leave speckles in your soap if not strained out. St Johns Wort Flowers Hypericum perforatum Color: Red - Infuse fresh flowers in liquid oil. If left un-colored, most handmade soap takes on a creamy shade. That’s because it’s picking up on the original soaping oils’ color. If you’d like a bright white soap, use white or clear soaping oils like coconut oil and less yellow oils. If all else fails, you can add a whitening powder to your soap at trace and Titanium oxide is probably the best of the ones listed below. Bentonite Clay Bentonite Color: White to green-white. Use 1-2 tsp PPO. Pre-mix in a Tablespoon of water before adding to your main soaping oils. White Kaolin Clay Kaolin Color: Off white. Use 1-2 tsp PPO. Pre-mix in a Tablespoon of water before adding to your main soaping oils. Titanium dioxide Color: Bright white. Add to soap batter at trace. Use 1 tsp PPO and I recommend premixing it in a little oil and then straining it through a sieve whilst pouring into your soap batter. Tiny clumps of un-mixed pigment can leave speckles in your soap if not strained out. This color is considered 'nature identical' but has been created in a controlled lab environment. This is because the truly natural mineral also contains traces of toxic heavy metals that cannot be used in skincare. Though one of the easiest natural colors to use to get a soft to vibrant yellow is Yellow Iron Oxide. If you’d like to try something more unusual though, I’d recommend some of the flowers — in particular Daffodils. Although the bulbs and other parts of the plant are toxic when ingested, you can still use the yellow petals to safely color soap a buttery yellow. Red Palm oil Elaeis guineensis kernel oil Color: Creamy yellow - Use at 1% in liquid oils. Safflower Carthamus tinctorius Color: Yellow to Orange-yellow - Add powder at light trace. Saffron Crocus sativus Color: Yellow. Infuse with oils before soap making or directly into the lye-water. Turmeric Curcuma longa Color: a common kitchen spice that tints soap light pink-yellow to burnt orange to a dark warm brown. Can also cause an attractive speckle to your finished soaps but this can be controlled. 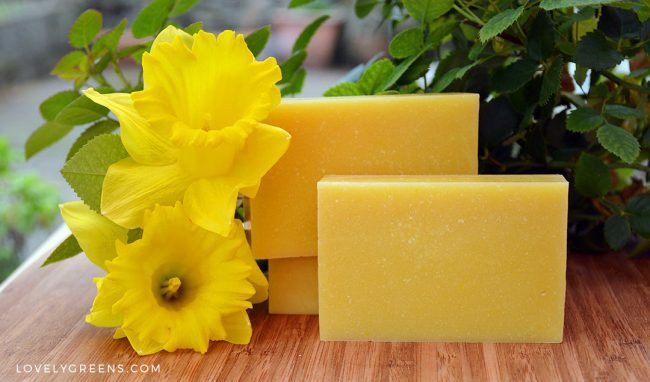 This tutorial shows you how to use turmeric to color handmade soap. Yarrow Achillea millefolium Color: Muted yellow - Use dried yarrow leaves and flowers to infuse your oils or add powder direct to soap at trace. Yellow Iron Oxide ci 77492 Color: Vivid yellow - Add to soap batter at trace. Use 1/16 to 1 tsp PPO and I recommend premixing it in a little oil and then straining it through a sieve whilst pouring into your soap batter. Tiny clumps of un-mixed pigment can leave speckles in your soap if not strained out. This color is considered 'nature identical' but has been created in a controlled lab environment. This is because the truly natural mineral also contains traces of toxic heavy metals that cannot be used in skincare. There are many ingredients that you can use to get soft beiges to chocolate browns in soap. One I use regularly in my own soap is honey. Add a teaspoon of honey to your lye-water and the heat will immediately caramelize it. Not only does it tint soap a rich fudge brown but it smells delicious too. Cinnamon powder Cinnamomum zeylanicum Color: can add speckles of brown color but can also be scratchy in feeling. Add only to exfoliating soaps and it's not recommended to use more than 1/4 tsp per pound of soaping oils. Can also be a skin irritant. Cloves (ground) Eugenia caryophyllus Color: Brown - Add to liquid oils or at trace. Can be scratchy and a skin irritant so use no more than 1/4 tsp per pound of oils. Henna, powder Lawsonia inermis Color: Green-brown - Add at trace. Olive leaf powder Olea europaea Color: Warm brown - Add at trace. Peppermint Mentha piperita Color: Beige to beige with dark specks if the leaves are left in - Infuse leaves in water/lye solution. Rhassoul Clay Moroccan lava clay Color: Brown. Use 1/2-2 tsp PPO. Pre-mix in a Tablespoon of water before adding to your main soaping oils. Rose-hip Seeds (ground) Rosa canina Color: Tan to brown - Add at trace. You’re spoiled for choice when it comes to natural green soap colors! They can give you anywhere from pale pastel to vivid grass green and come in a range of plants, clays, and minerals. My top pick would have to be French Green Clay which gives a soft and natural green. Avocado puree Persea Gratissma Color: Shades of yellow-green. Add at trace. Green Chromium Oxide ci 77288 Color: pastel to garden green - Add to soap batter at trace. Use 1/16 to 1 tsp PPO and I recommend premixing it in a little oil and then straining it through a sieve whilst pouring into your soap batter. Tiny clumps of un-mixed pigment can leave speckles in your soap if not strained out. This color is considered 'nature identical' but has been created in a controlled lab environment. This is because the truly natural mineral also contains traces of toxic heavy metals that cannot be used in skincare. Hydrated Green Chromium oxide ci 77289) Color: Minty green - Add to soap batter at trace. Use 1/32 to 1 tsp PPO and I recommend premixing it in a little oil and then straining it through a sieve whilst pouring into your soap batter. Tiny clumps of un-mixed pigment can leave speckles in your soap if not strained out. This color is considered 'nature identical' but has been created in a controlled lab environment. This is because the truly natural mineral also contains traces of toxic heavy metals that cannot be used in skincare. Cucumber Cucumis sativus Color: Bright Green - Add as a puree at light trace. French Green Clay Montmorillonite Color: Some have the experience of soft, natural, green. I've seen it turn out more of a light tan tint. Use 1-2 tsp PPO. Pre-mix in a Tablespoon of water before adding to your lye water. Grass (Barley) Clippings Hordeum vulgare Color: Green - Infuse fresh clippings in water and use in lye solution. Kelp, powder Fucus versiculosus Color: Dark green - Add to liquid oils or at trace. Pre-mix in a little oil before adding. Nettle leaf (powder) Urtica dioica Close to Lime-green - Add direct to liquid oils or infuse oils with the leaf and discard. Parsley Carum petroselinum Color: Green - Add to liquid oils or at light trace. Use fresh, powdered, or in dried flakes. Spinach Color: Light green. Use as a puree or powder and stir in at light trace. Black soap looks incredible and in some cases can add skin benefits. Activated charcoal is said to have cleansing and purifying properties and can tint soap a light grey to dark black. You’ll need to use quite a lot of it to acheive darker shades though. Activated Charcoal (powder) Color: Deep black - add to liquid oils or to soap at light trace. You have to use quite a lot of it to get darker shades of gray and black. Mix with a small amount of liquid oil first and add at trace. Black Iron Oxide ci 77499 Color: Grey to black. Black mineral powder that blends without any texture. Mix with a small amount of liquid oil first and add at trace. Coffee Grounds Coffea Arabica seed Color: Black specks. Add fresh or used coffee grounds to your soap at trace. A teaspoon per pound of oils is plenty. Are mica’s actually considered natural? I know they are naturally mined but it was my understanding that dyes were added to most of them to get those bright vivid colors? Micas are a tricky one to give a label to. Some are made using only ‘nature identical’ micas and pigments. Others use dyes which are definitely not natural or nature identical. Hi, im so blessed to have found your website. I am creating a natural at home skincare line that i would like to sell to my community. I have the products i would like to make and oils along with it. I wanted to know do you mentor?. I didn’t see measurements for Rhassoul clay. I want to assume it’s the same answer as French green clay. I’m trying to achieve a brown color with it. FYI, Hibuscis flowers do NOT keep a pink or red color. They turn a dark bluish purple. I hate seeing incorrect information because it makes me doubt everything. Hi Teresa, natural soap colorants can give differing colours depending on the technique, temperature, and amount used. Saying that, this is one colour that I’ve not yet tried personally. There are accounts online of people using hibuscis and getting everything from a red colour to brown. Dark bluish purple is a new one to me! What technique do you use? WOW, SO EXCITED TO HAVE FOUND YOUR WEBSITE!!! THANK YOU!! I want to make soap using red wine. Which natural red soap color would you recommend for a burgundy/maroon color? Thanks for the quick response. I’ll let you know how it turns out. I’m curious if I could use zucchini juice in place of water in soap? Or will it do something gross to it? You could but I can’t really imagine a reason why you would. What’s your idea? I have found that lightly scented waters don’t really hold up once the lye is made. Things like aloe juice and rose water are overcome by the chemical reaction taking place. You would probably get better results from putting peel shreds into your soap at heavy trace. Beer and wine, on the other hand, hold up really well and produce some really interesting soaps. I just made a batch of Tangerine IPA with orange zest and it might be my favorite yet. hey. whatsup!? 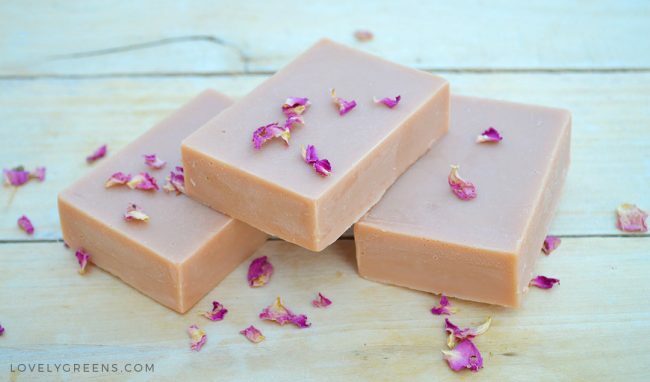 have you ever try to make red soap with St Johns Wort infused oil? I’ve not yet tried but have seen it referenced as a natural soap colourant. Great information. Thank you. How can I print this page? I do love the daffodil colour and was all set to pick some this spring. BUT then somebody mentioned that daffodils are poisonous….So, would it be a good idea to put it in soap?? Hi Heike! Many things that are toxic when eaten are safely used in skin and hair care. Imagine what would happen if you ate some shampoo. On the other hand, Daffodil extract is used in many high end skincare formulations and is known by the name narcissus tazetta in the ingredients. It’s used as an antioxidant and is touted as being a youth-reviver. I won’t make such claims though. The poison in Daffodils mainly comes from lycorine, an alkaloid that’s most concentrated in the bulb but is also present in the leaves and flowers. When ingested it can cause severe sickness and vomiting. The bulbs also contain oxalates, microscopic needle-like structures similar to the ones that you find on Nettles. When ingested they can cause a lot of discomfort and on the skin they feel like a nettle burn. 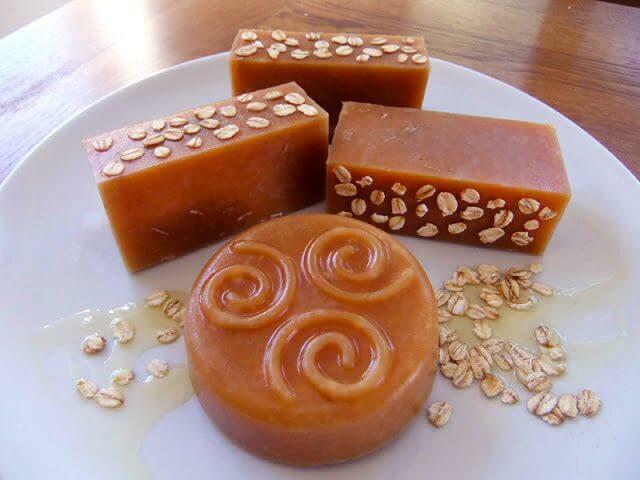 Hi Tanya: Thank you for posting these great Soap Making instructions. 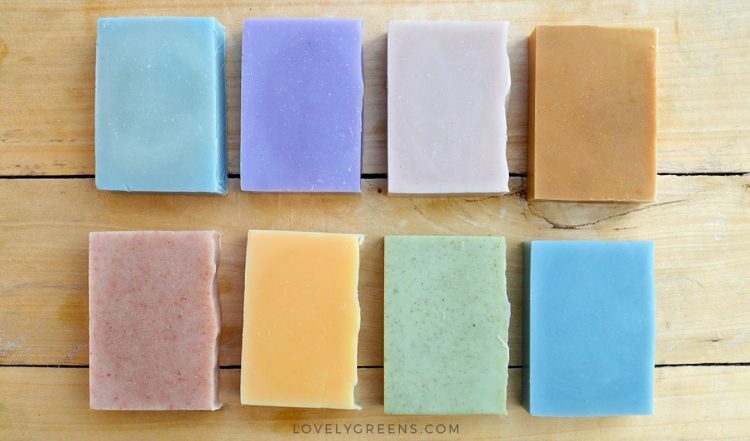 Love the beautiful, fresh colors of all your soaps. I love making soap with herbal based colorants and essential oils. Thank you so much Anne-Marie 🙂 I really like subtle and feminine colours and think natural ingredients can be so effective in creating them. Informative as ever ! I made a batch recently using alkanet and its more of a vanilla fudge colour i guess i should have used more? Yes, you could use more but Alkanet changes colour over time so wait first and see what colour it is after about a month. Just wondering which of these can be used for hot process soap? I have having an extremely hard time finding hot process soap colorant information. Thank you. I’ve made hot-process Ashely but it’s not my area of expertise. However, I don’t see why you couldn’t use any of these for HP as well as CP. The colour will probably deepen with HP but your best bet is to try and see.